Jonah Fertig goes over the agenda for a meeting Sunday, Nov. 27, 2011, among OccupyMaine activists. The goal of the meeting was for the group to decide what steps it will take next in terms of remaining at Lincoln Park. 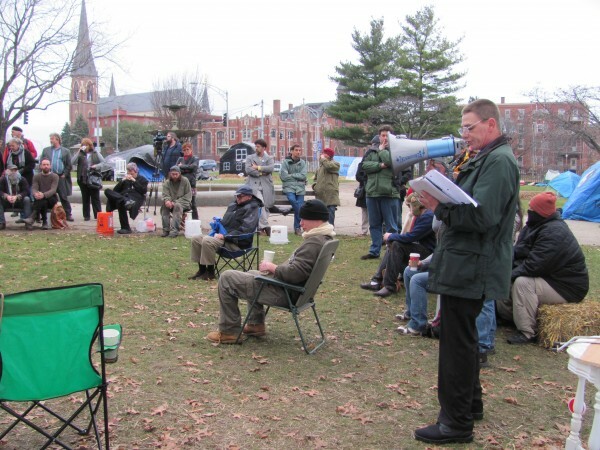 Alan Porter, who says he has spent every night at the OccupyMaine encampment at Lincoln Park, addresses a group of about 80 activists on Sunday, Nov. 27, 2011. The Portland-based encampment spent much of Sunday afternoon debating its next steps in light of city government's request for the encampment to secure various permits. Protesters are arrested on the lawn of the Blaine House during a rally by Occupy Augusta, Sunday, Nov. 27, 2011, in Augusta. Police say nine people were charged with criminal trespass and failure to disperse after refusing to leave the lawn of the governor's mansion. 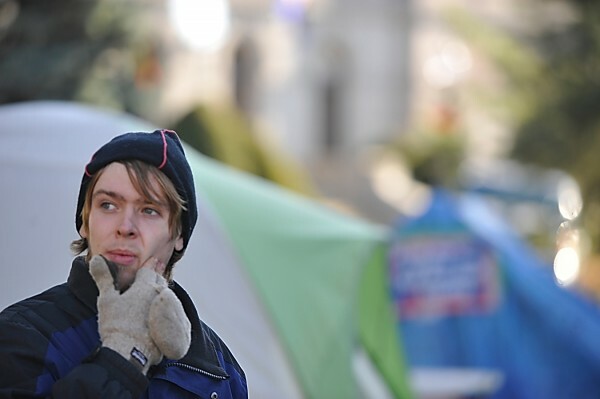 Standing in Peirce Park, Chris DesRoches, a spokesperson with Occupy Bangor, surveys the group's encampment on the grounds of Bangor Public Library on Nov. 21, 2011. 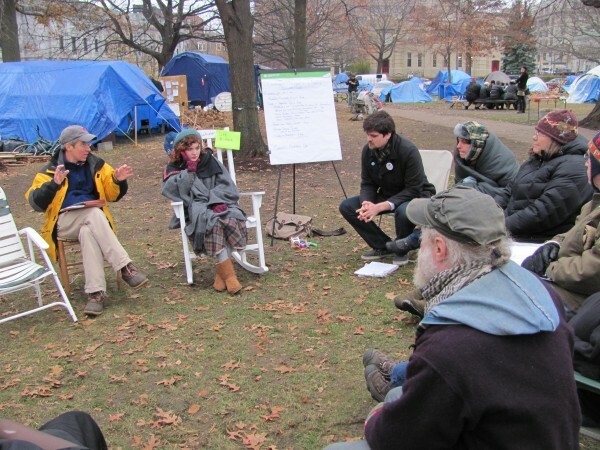 Portland-based attorney John Branson (left) provides legal advice to members of the OccupyMaine movement, who have lived in an encampment in Lincoln Park since early October. 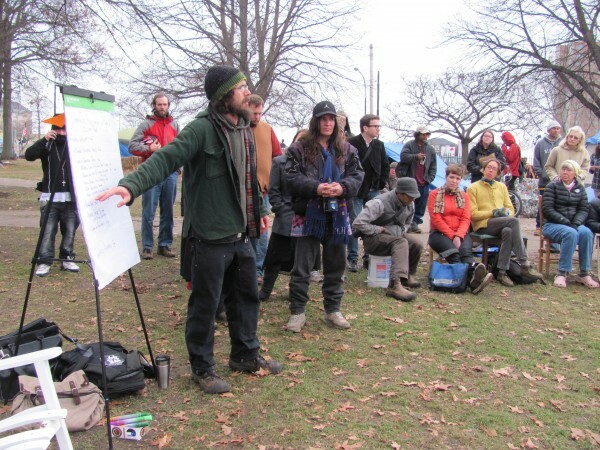 The group was attempting to make decisions on Sunday, Nov. 27, 2011, that will affect the future of the encampment. PORTLAND, Maine — Three Occupy encampments in Maine spent the weekend deciding their future in light of pressure from officials in Portland, Augusta and Bangor for the activists to either move on or obey a slew of rules. In Augusta, where most participants spent Sunday packing up their encampment at Capitol Park, nine protesters were arrested after they refused to leave the Blaine House, Gov. Paul LePage’s nearby residence. At Bangor’s Peirce Park, protesters were under orders to remove their tents every day by 10 p.m. until they clarify with city officials the rules that govern activities in Bangor’s parks. And in Portland, a group of about 80 occupiers spent much of Sunday afternoon and evening debating whether to apply for a permit from the city before ultimately deciding to submit a request. In Augusta, the activists dejectedly took down most of their encampment at Capitol Park, according to The Associated Press. By afternoon, more than a dozen protesters relocated to the nearby governor’s mansion where they held signs near the Blaine House’s entrances and banged on a large drum. State troopers, who guarded the mansion’s entrances, made several arrests after the protesters jumped the gate around the property and unfurled a banner on the portico of the house. As smaller tents were being taken down by their owners Sunday, encampment leaders said a large tepee loaned by the Penobscot Indians and a large all-weather tent will stay up. The smaller tents had to come down sooner or later anyway because they would collapse under the weight of the coming winter’s snow, Occupy’s Jim Freeman of Verona Island said. On Monday, Freeman, who was one of the nine arrested on Sunday, is to meet with police to discuss the protesters’ next step, but he said they won’t ask for a permit. Freeman said his group believes a permit is not necessary because its followers are engaging in an ongoing, constitutionally protected assembly. “Their law on assembly is defunct,” said Freeman of Verona Island, one of the protesters who was arrested. He said the courts have struck down laws on the books regarding assemblies, and that the group filed an injunction in federal court Monday in order to maintain their encampment. In Portland, protesters met Sunday evening to decide whether to apply for a permit to remain at Lincoln Park, which are due by the end of the day Tuesday. The debate stretched into the late evening before the group decided to request the permit. Among the city’s concerns are limiting the number of tents and protesters, defining a length of stay, ensuring that tents and buildings adhere to building and fire codes, regulating which areas of the park are occupied, ensuring tents are far enough apart, requiring that there are no open fires, no smoking in tents and that fire extinguishers are available near the kitchen structure. According to Brian Leonard, 42, of Portland, who has helped organize the encampment but does not live there, things went relatively smoothly at first, but then people who are not part of the Occupy movement began to show up and cause problems. Leonard estimated that at night there are more nonprotesters at the encampment — many of them from Portland’s homeless population — than protesters. According to Leonard and others, some of the nonprotesters have been abusing substances and acting violently. Since Thursday, there have been four separate violent incidents, including a protester being hit on the head with the blunt end of a hatchet. Leonard said it’s unfortunate that these incidents are marring what he said is an otherwise peaceful and organized protest. “Personally, I feel that if this continues the way it is, the city won’t allow us to stay,” he said. Alan Porter, 45, of Portland, agreed. Porter says he was among the first group to occupy Lincoln Park and has slept there every night since except for one. Activity at the Occupy Bangor encampment in front of the Bangor Public Library was subdued Sunday afternoon. A large section of grass was visible in the adjacent Peirce Park where the large tents used for storage by protesters collapsed under Wednesday’s snowstorm. Storage tents were set up Friday and Saturday on library property. Chris DesRoches, a protester who has camped an average of five nights a week at the site since Oct. 29, said Sunday that they would not set up tents in the park until they clarify with the city the ordinance that governs activities in its parks. The city has said the group must remove its tents in the park each night by 10 p.m. and should apply for a permit to conduct other activities there. The city considers the group to be conducting an event while protesters call themselves an assembly. The library board has said protesters can camp overnight and have storage tents on its property. “We’re going to continue working with the city so we can stay for the long term,” DesRoches said in a telephone interview. Bangor Daily News writer Judy Harrison and The Associated Press contributed to this report.